Bunyoro squabble: Besigye Rally blocked in Masindi! As the Police has monitored and followed the moves of Forum for Democratic Change in Bunyoro, even standing guards around the compounds of the retreat that the FDC during the week. You can tell that the government does not spare a single shilling in the mind of keeping the FDC at bay. Clearly, the Police Force in Masindi was preoccupied with handling the matters and silencing the FDC. Not catching criminals, because that is not important in the Republic of Uganda. It is more important to count the steps and gasoline run by the White SUV of Dr. Kizza Besigye. Therefore, this shallow and truthful news coming from URN wasn’t that surprising considering how many times they have done it! “The officials arrived at Masindi Stadium at around 5pm and agreed with police to conclude the rally within 30 minutes. Dr. Kiiza Besigye, the former FDC president addressed the residents and urged them to jealously guard their land from government officials who have turned to it for survival since they have stolen all the money for service delivery” (…) “Besigye ignored the directives and continued speaking leading to a heated verbal exchange between FDC party officials and heavily armed police personnel. As a result, Police threatened to use teargas prompting Besigye to cut short his speech and drive away with police patrol cars behind him. Waiswa told reporters that they couldn’t allow Besigye go beyond the allocated 30 minutes” (Ogga & Gucwaki, 2017). So again, the Police Force has stopped a rally, another rally in the series of spreading the information of land grabbing and of making sure the citizens know their rights. That is deemed unfit and not the sort of subject the citizens need. Especially in districts close to the vast oil reserves, which the state intent to only to supplement the income of the President, not his fellow citizens. If it were, wouldn’t the new debt in the budgets be recovered sooner, instead of a Presidential Handshake? Well, as state of affairs goes, the state continues to hamper with rallies of opposition, the police continue to vital part of politics, instead of fighting crime. The Police is more concerned with the moves of FDC and “Bad DP“, than of actual police work. The opposition are more often criminals, than the average chicken thief’s, just pound on that for a hot-moment. Certainly, it will be more chicken-soup and less chicken, boiled water on bones instead of flesh. Since, the Police Force cannot stop themselves from being political active. Their mandate under this administration is to subdue and silence the ones who does not comply with the vision of Museveni. Peace. Here I will back into the past, as I have done with Museveni directly connected to violence in the past. Here it is more general. Some of this is to refresh the memory of the matter. And when the Government; back in the called all of this rubbish, it must have been some facts that the government doesn’t want into the light. There is certainty that this will shed some lights on matter of Corruption, Oil-Money, Election-Rigging and other saucy tales of the recent past. Enjoy! President Museveni has gotten tired of multi-party-ism after the dissidence to agreement between Asian business deals to make the Mabira Forrest into a sugarcane farms. Especially President Museveni is tired of FDC and Dr. Kizza Besigye and how he is addressing the matters of Mabira Forrest. Because the NRM is happy with their trade between Government of Uganda and the Metha Group that Besigye and the public who has a feeling that Indian business are getting sweet-deals, but the ordinary workers are getting anything. Certain sources are saying that the Cabinet has made an agreement with the World Bank on the Bujagali Dam, but a part of that deal is to secure the Mabira Forrest. Museveni’s argument for the sale is to get the country into a middleclass county and in that way you have to use all the countries minerals and resources (WikiLeaks, 2007). On the 1st March of 2007 has re-arrested the main offenders from the Peoples’s Redemption Army (RPA). These offenders are suspected on both murder charges and treason charges. They we’re given bail, but the police didn’t treat them correctly. The Police beat them with batons and their defense lawyers were injured in the altercation. 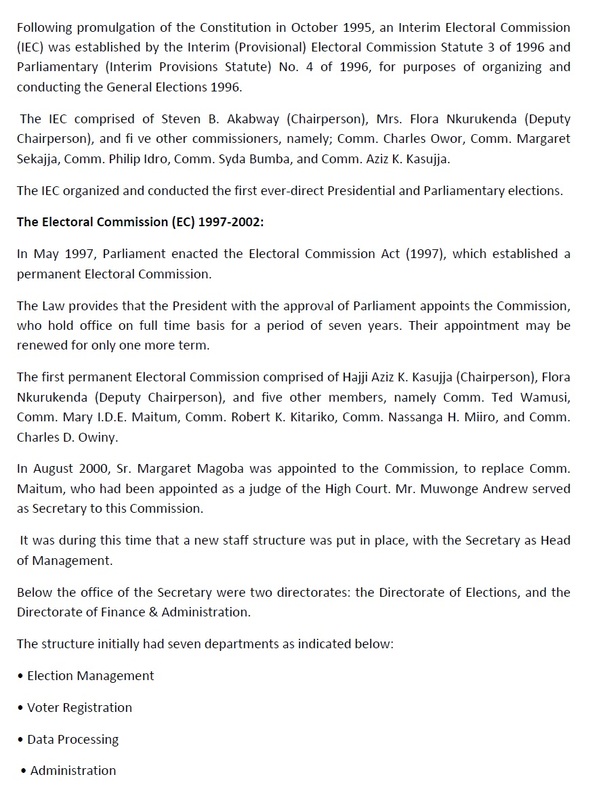 “Minister of Internal Affairs Ruhakana Rugunda said that the PRA had been released on bail for the treason charges against them, and that the Government respected this decision” (…) “Principal Judge James Ogoola said that he was: “concerned for the Court, for liberty in this country, and for the peace of this country” (WikiLeaks, 2007). On the 13.06.2007 the High Court judge Caroline Okello granted the brother of Dr. Kizza Besigye bail. He is Joseph Musaizi Kifefe. He was charged at the time for being part of the uprising of the PRA (People’s Redemption Army). Further on he will stand trial for treason against the state. The lawyer for Kifefe has applied for bail on the grounds of medical condition of his client since he has blood cancer and need treatment at Mulago Hospital. On June 18 2007 he was discharged from Hospital after treatment that has lasted for over a month. The conditions for the bail was set for that he has to report to the Kampala Central Police Station, do this twice a month and register that cost $6,000, leaving behind his passport and not allowed to travel without permission. The issue for giving Kifefe bail was that the Government of Uganda feared the smear and loses appeal with the donor nations. Next date that is set for PRA suspects is set for July 16.2007 (WikiLeaks, 2007). In January of 2006 the President Museveni requested that the Inspector General of Government (IGG) to investigate the former Minister of Health Jim Muhwezi. This was because of the alleged scheming money from the vaccine program of Global Alliance for Vaccine and Immunization (GAVI). The funds for this program were instead spent on SIPIDIS – Constitutional Referendum and National Resistance Movement. President Museveni asked First Deputy Prime Minister Eriya Kategaya on how much of these funds we’re used for campaigning in 2005-2006. While the President pushed for IGG to investigate the Fund. Janet Museveni tried to stop this and support Jim Muhwezi. In April of 2007 the Justice Faith Mwondha that the former Health Ministery and other government officials had misused the GAVI funds. These persons were Jim Muhwezi, Mike Muluka, Alex Kamugisha and also the first lady niece Alice Kaboyo was part of the corruption case. The case was for the missing $900,000 from the $4,8M. 4th May 2007 Jim Muhwezi filed a petition against the case to block President Museveni’s case against the Gavi Corruption case. The argument being that it’s an independent institution that shouldn’t follow orders by the President and should get its mandate from the Constitution. The answer from the President came on the 16th May 2007 when he went to Constitutional Court to swear an affidavit that claims the corruption of Muhwezi and Kaboyo. At the same time the President claimed he hadn’t interfered in the investigation of the IGG. 18th May 2007 the arrest warrants on the Muhezi and Kaboyo was sent out. That also Kaboyo was implicated was not something the Ugandan public expected since she had been a part of the household of Museveni. Kaboyo claimed that she did this on verbal agreement with the President. Muhwezi was away when the arrest order came, but he turned to the police in 28th May 2007 from there he was sent to Luzira prison. Mukula and Kamugisha were granted bail on the 25th May 2007. The issue with this case was that the party of people took more money than where authorized to do and didn’t prove what they used that money for. Muhewezi is now seen as “not political responsible”. The Cabinet wanted just to “clip his wings” because they could be implicated by the case. This is something the President Museveni accepted (WikiLeaks, 2009). 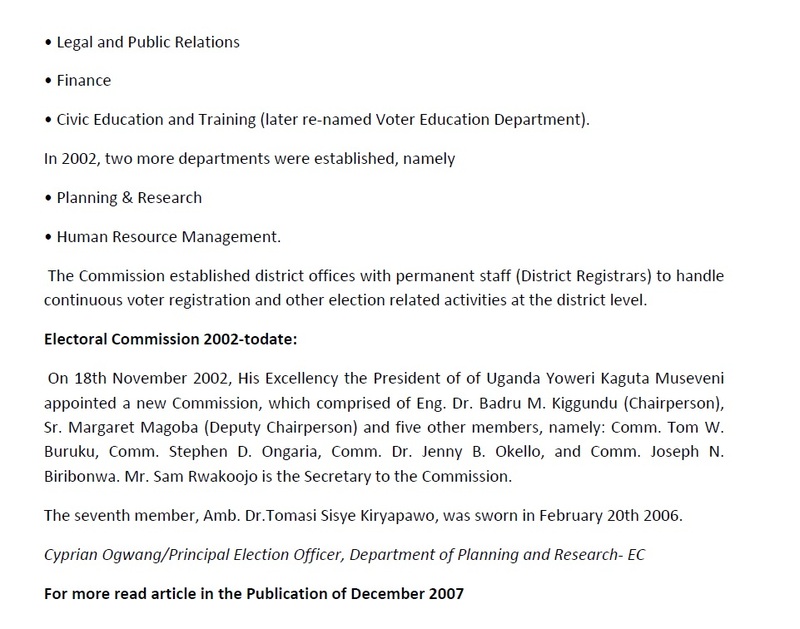 4th November 2008 there was held by-election to fill the seat of the Kyaddondo North of the Wakiso District. “NRM candidate and son of Kibirige, Robert Kibirige Kasule, won the tightly contested race with 8,183 votes – just 60 more than DP candidate Regine Bakittee. Forum for Democratic Change (FDC) candidate Pallyne Nakabuye finished a distant third with 1,900 votes” (…) “Allegations of electoral malpractice, including ballot stuffing, bribery, multiple voting, and violence were widespread. In one confirmed incident, a polling station’s presiding officer and other officials were found at the site before the polls opened with a number of pre-marked ballots already in the box. The police and Electoral Commission Returning Officer were called in and the presiding officer was later arrested and the ballot box confiscated” (…) “DP Legal Advisor and Kampala District parliamentarian Erias Lukwago told the press that the election was not “free and fair” and vowed to seek legal redress” (…) “DP Secretary General Mathius Nsubuga contacted members of the diplomatic community to encourage missions to observe the election on December 4. Nsubuga expressed concerns about increased Ugandan military deployments in the area in the days leading up to the election and reported increased incidents of intimidation. He reported that Bakittee’s campaign manager had been knocked down in a hit-and-run car accident involving a government-marked vehicle” (WikiLeaks, 2008). “De Temmerman expressed deep concern over the state of Ugandan journalism. “What is happening in the Ugandan press is pure exploitation and fabrication,” she commented. De Temmerman said that journalists are often paid to write stories aimed at destroying political rivals or advancing private economic agendas. She pointed to coverage of the recent National Social Security Fund’s questionable purchase of land belonging to Security Minister Amama Mbabazi and approved by Finance Minister Ezra Suruma (reftel). She said that a “considerable amount of money” exchanged hands as Parliament’s probe moved forward and that a number of her journalists had been offered bribes to “hit Mbabazi hard.” (…)”“The Red Pepper is 90 percent fabricated,” De Temmerman affirmed (Note: The Red Pepper is a salacious tabloid that is used by the government and private individuals to malign enemies. End note.). She expressed concern that the paper’s readership was rising and that some Ugandans might actually mistake it for factual journalism” (WikiLeaks, 2008). On 21th May of 2009 was there held in 79 districts that will fill the new seats in local councils and sub-country level. Observation teams saw this: “Voter turnout was low and there were very few contentious contests. However, there were a number of irregularities and concerns that in a larger, more controversial election could be cause for conflict or possibly a rejection of the results. Observation teams reported that several polling stations opened late due to tardy polling officials, missing or delayed voting materials, and rain. Observers also recorded problems with the voter identification process, including multiple voters without voter identification cards or other identity documents, missing names, un-alphabetized voter registries, and conflict between polling officials and party agents over the identity of undocumented voters (Note: There were allegations that the ruling National Resistance Movement (NRM) party’s officials brought people to the polling stations without identification to vote in the place of deceased individuals still on the list. End note)” (…)”Monitors reported inconsistent ballot box sealing procedures, mostly believed to be the result of poor training rather than fraud. In some instances, polling officials mistakenly used regular ink instead of the indelible ink to mark voters’ fingers. In at least two cases, individuals responsible for marking voters’ fingers were absent from their posts. Many polling officials, party agents, and Uganda Police Force (UPF) constables appeared to lack a strong understanding of their roles and responsibilities in the voting process and thus failed at times to properly enforce electoral laws. This, combined with limited voter education and information, often led to confusion and in some isolated instances verbal confrontation. In one district, observers reported a more serious case of ballot stuffing. Although observers reported these findings to the District Electoral Registrar, the results from the station were still considered valid and were included in the final count” (WikiLeaks, 2009). “On October 22, Uganda’s main opposition newspaper published excerpts of an internal NRM report accusing core EC officials of conspiring with opposition parties to place “ghost” voters and “phantom” villages on Uganda’s voter rolls. Opposition parties have identified a new EC as a prerequisite for their participation in the 2011 elections because they view the current EC as pro-NRM (refs. A, B and C). Various iterations of the NRM report accuse the EC of placing 500,000 to one million pro-opposition “ghost” voters on the voter registry to force the NRM’s Presidential candidate into a second round election run off in 2011. The report singles out EC Secretary Sam Rwakoojo, Legal Council Alfred Okello Oryem, and a handful of mid-level officials for corruption, fraud and conflict of interest, and recommends firing Rwakoojo “forthwith as he as done the most to damage (the) NRM.” (WikiLeaks, 2009). “The NRM membership campaign probably also serves to strengthen Museveni and Mbabazi’s power within the party. NRM leaders are likely looking to prevent an embarrassing repeat of the 2006 legislative election when 37 NRM members, frustrated by the lack of internal democracy within the party, defeated hand-picked NRM candidates by running for parliament as political independents. With the registration campaign, party members could be identified earlier and threatened with permanent alienation from the NRM if they bolted to seek election as independents. Mbabazi may also use his control of the registration campaign to boost his own embattled position within the party by withholding registration to those in the NRM who do not support him. Mbabazi’s position as Secretary General is up for re-election in late-2010, and he will likely face stiff competition for the NRM’s contested top spot” (WikiLeaks, 2009). “The government closed five radio stations on September 11th two CBS stations plus Suubi FM, Radio Sapientia, and Radio Two Akaboozi Kubiri – for violating Uganda’s Electronic Media act. At least two other stations – Radio Simba and WBS TV – have been warned to censor their reporting or risk closure” (…)“On September 11, well known Radio One talk show host Robert Kalundi Sserumaga was abducted by unidentified assailants riding in an unmarked sedan as he left the WBS studio. He was later dumped in front of a police station and arrested” (WikiLeaks, 2009). “Rioting in Kampala subsided on September 12 after the King of Buganda postponed his visit to the disputed district of Kayunga” (…) “There was sporadic gunfire during the morning of September 12 on the outskirts of Kampala, as well as road closures and checkpoints near the city center amidst a heavy police presence. Several police posts and dozens of vehicles were burnt during the riots. One reportedly Asian-owned paint factory was also torched” (…) “On September 12 Buganda Prime Minister John Baptist Walusimbi asked the Inspector General of Police, Kale Kayihura to “restrain his officers and men from indiscriminate shooting against unarmed civilians in order to cool the temperatures.” (…) “On September 14, state media reported 21 dead and over 100 injured (including 13 police officers) during two days of rioting. Some of those brought to Kampala’s overflowing Mulago hospital, including a two year old child who was killed, were hit in their homes by stray bullets” (…) “An estimated 550 to 650 people were arrested during the riots. Local media reports only 82 of these have been charged, meaning that the rest should either be charged today or released” (…) “Museveni also accused Libyan leader Muamar Qadhafi of trying to destabilize Uganda by funneling funds to the Baganda as payback for Museveni’s opposition to Qadhafi’s United States of Africa proposal” (WikiLeaks, 2009). On 14th October 2009 President Musveni told the press that those who are torturing Ugandans will be severely punished. The president does this because he want to squash the allegations that been made in UHRC that agencies of the state is violating the Human rights. Reuters also questioned the President on the arrest and beating of the journalist Robert Kalundi Sserumaga. Later on 18th October 2009 NRM spokesman Ofwono Opondo he was ashamed of the actions of the UPDF, the Police, Prisons and intelligence agency. Opondo has claimed that he didn’t Understand why this was happening since the government agencies are more educated then before therefore it’s a shock that they torture the people they are arresting. IGP Gen Kale Kayihura on the 17th October he had to change the Rapid Response Unit(RRU) in the Police after claims of torture of alleged corruption case against the Executive Director of UNFA (Uganda National Forestry Authority) and his wife where the RRU is suspected of detaining them for a week and threathen to torture them. The RRU director David Magara was because of this moved from his position into a leadership role in the CID (Criminal Investigation Directorat). In Hoima the mayor who is a part of the FDC Atugonza is in proceedings against the state for a torture case where he was attacked by JATT (Joint Anti-Terrorist Team) in April 2009. This was a closed session from the public. The Mayor of Hoima claimed in court that he was sent to a “safe house” and tortured there by the CMI (Chieftaincy of Military Intelligence). Because of this Dr. Kizza Besigye has said that he would make litigation against Minister of Security Amama Mbabazi for the treatment of Atugonza by security agencies he controls (WikiLeaks, 2009). “On November 11, Minister of Lands Adolf Mwesige asked Parliament to approve the creation of seven new administrative districts on top of the 14 districts already slated for creation in 2009 and 2010. If approved, this will bring the total number of administrative districts to 101, or three times the 33 districts existing when Museveni took power in 1986” (…) “According to the Commissioner for Local Councils, Patrick Mutabwire, all of the 39 districts created between 2005 and 2009 depend on the central government to cover 90 percent of their expedenditures. At the moment, government service provision in new districts remains poor or nonexistent” (…) “According to the Commisioner for Local Councils, new district start up costs range from USD 300,000 for smaller districts to USD 1 million for larger ones, and each new district employs between 250 to 500 local government employees/ new districts are attractive job creation mechanisms for the Ugandan government. 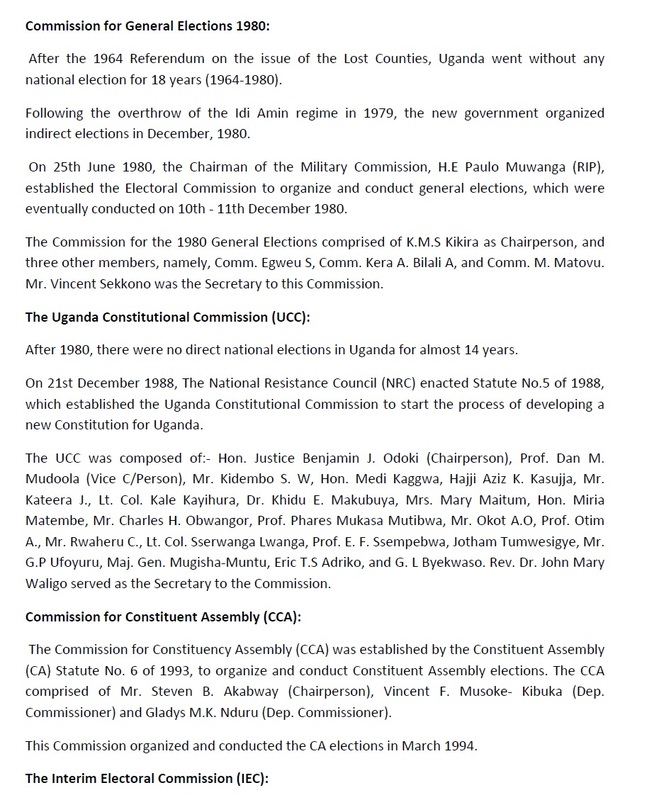 These appointments provide a chance for the ruling National Resistance Movement (NRM) to reward specific constituencies and individuals, or entice opposition members back into the NRM camp” (WikiLeaks, 2009). “The report claims that Mbabazi is using a front company belonging to the European owner of Asante Oil, and that ENI representatives distributed “fat envelopes” to a number of visitors – including Energy Ministry officials, representatives from the Office of the President, journalists, and Bunyoro Kingdom officers – while installed at a safari lodge in Murchison Falls National Park close to where drilling has occurred. NOTE: EconOff witnessed ENI’s presence at this lodge during a trip to Murchison in early December. END NOTE. Much of the report highlights ENI’s Libyan ties and accuses Qadhafi of funneling money to the Bunyoro and Buganda Kingdoms to destabilize the Museveni regime. The final two sections of the report purport to “show how ENI corrupts a country’s leadership and forces them to take unpopular selfish policies,” and the “dangers” of an ENI/Libya deal” (WikiLeaks, 2010). “On 14 December, Tim O’Hanlon, Tullow Oil’s Regional Vice President for Africa met with Ambassador Lanier to discuss recent developments in oil exploration in Uganda (see ref. A for background). O’Hanlon explained that the $10+ billion required to produce, refine, and export oil from Uganda far exceeds the financial capacity of Tullow and other mid-sized exploration companies currently working in Uganda. Tullow is therefore considering selling a portion of its Uganda holdings to a larger international oil partner, and has unofficially “short listed” three major companies as potential partners – including Exxon Mobil, Total (France), and the Chinese National Offshore Oil Company (CNOOC). After Tullow concludes its process of selecting a partner, likely in January or February 2010, Tullow will present the “bids” to the Uganda government and work with Ugandan officials to gain approval of the much larger oil partner” (…)”O’Hanlon referred to Minister Mbabazi, who facilitated an August 2009 meeting between ENI and Tullow, as ENI’s “patron” in Uganda, and said ENI created a shell company in London – TKL Holdings – through frontmen Mark Christian and Moses Seruje – to funnel money to Mbabazi. O’Hanlon also noted what he described as Onek’s recent unsolicited “grandstanding” before Parliament in support of ENI, and similar statements of support during a recent Indo-African energy conference in New Dehli. Onek made impossible claims at the Indo-African conference regarding ENI’s ability to export 100,000 – 200,000 barrels per day within two years” (…)”O’Hanlon said ENI’s Uganda deal is part of a wider effort, facilitated by Heritage, to gain control of all oil fields on both sides of Lake Albert. In addition to its exploration blocks in Uganda, Tullow claims to have exploration rights on the Congolese side of Lake Albert” (WikiLeaks, 2009). This here must been seen as interesting, doest it? Aye? Especially so close to the elections, I am sure the local media would not like this to come out, especially the New Vision and such. 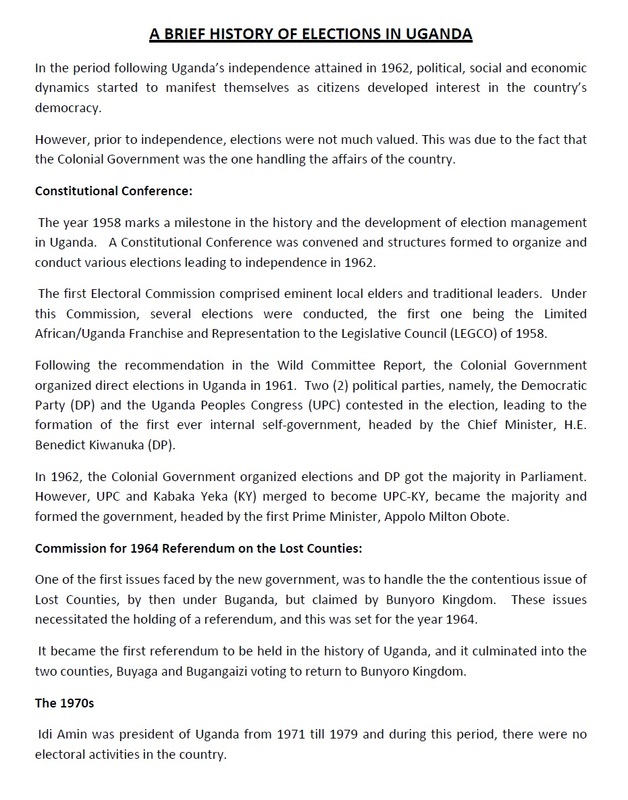 I am sure Amama Mbabazi will not like this, but the history is the history, and people should know this, so you make the right decision on the polling day! Peace. Bulisa has its own challenges from land grabbing to massive corruption. Our campaign is two way, while we have a national agenda to bring change for all Ugandans Bulisa needs urgent interventions many have lost their land through dubious deals harbored by a very powerful group that is waiting to share the oil spoils. Our campaign is about reclaiming our power back as a people, Bulisa needs to have power in order for oil to work for them.